Many traditional US political alignments are being scrambled by Donald Trump’s election. We may soon be able to add to that list another one: the usual partisan attitudes towards the federal and local governments. When the framers of the Constitution were still debating the shape of institutions we have today, 95 percent of America was rural, as the 1790 census classified the population. The Connecticut Compromise at the time created the Senate: one chamber granting equal voice to every state to counterbalance the House, where more populous states spoke louder. And they made sure the compromise stuck. Today, equal state representation in the Senate is the only provision in the Constitution that remains singled out for protection from the amendment process; no state can lose its full complement of senators without its permission. But even as a deliberately undemocratic body, the Senate has slipped further out of alignment with the American population over time. The Senate hasn’t simply favored sparsely populated states; politicians in Washington created sparsely populated states to leverage the Senate’s skewed power. … Republicans in Congress passed the 1862 Homestead Act, offering free land to settlers who would move to territories that would eventually become states — creating more Senate seats and Electoral College votes for a Republican Party eager to keep government control away from Southern Democrats. They even managed to divide the Dakota Territory into two states, worth twice the political power. 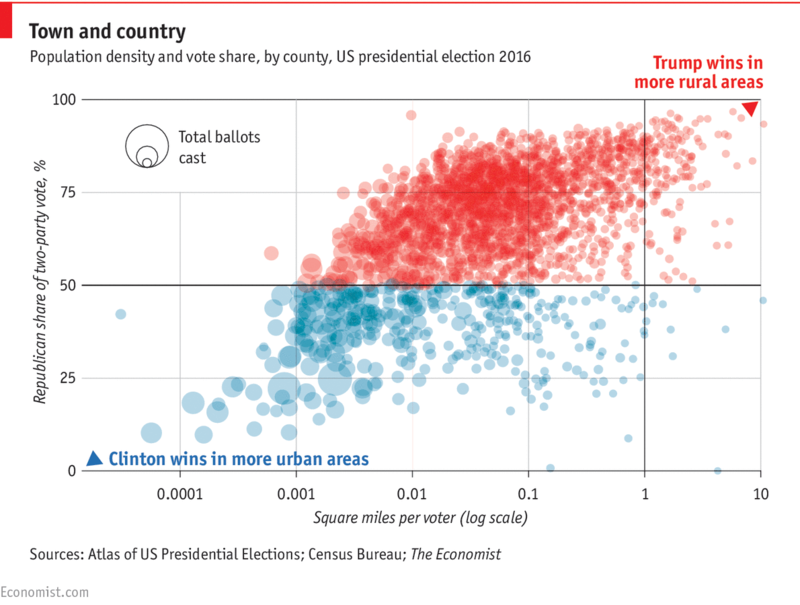 Population density explains a lot about recent voting patterns: low-density places tend to vote Republican, and high-density places tend to vote Democratic. So this quirk of the US system has large electoral consequences. The US population is also becoming steadily more concentrated in large urban areas. According to Census Bureau data, the share of the US population that lives in the 20 largest metropolitan areas (of which four are in California) has risen from 37.7% in 2010 to 38.2% in 2015, a steady pace of one-tenth of a percentage point per year. If this trend continues, and I don’t see why it will not, the structural disadvantage of Democrats in the Senate and Electoral College will only increase. So it will probably become harder and harder for Democrats to achieve unified control of the federal government. This is a challenge to both parties’ recent self-image: Republicans have been the party of states rights’ and local autonomy, campaigning against federal overreach, while Democrats have been the party of federally guaranteed civil and political rights, campaigning against entrenched local inequality and discrimination. But with the federal government firmly in Republican hands for the next few years, and possibly longer, Democrats seem to be having a change of heart about the role of local governments. Democrats are now praising local governments’ sovereignty and autonomy as a way to preserve important rights and values–in much the same way that Republicans traditionally have. And part of what’s important to remember is our own power in this moment here in New York City and in cities around the country, because in the confusion something important has gotten lost. There is not a national police force. You don’t go to federal schools to get your children an education. No. We in the City of New York, we protect our people with the NYPD. We provide education to our children with our New York City public schools. We provide healthcare with our public hospitals; and all over the country the same. Our constitution says it – that so much of what is decided in the governance of our people is decided at the local level, according to the values of the people who are governed. In the Declaration of Independence there is one of the most simple and powerful passages – it says, governments are instituted deriving their just powers from the consent of the governed. We don’t consent to hatred. And we will fight anything we see as undermining our values. And here is my promise to you as your mayor – we will use all the tools at our disposal to stand up for our people. If all Muslims are required to register, we will take legal action to block it. If the federal government wants our police officers to tear immigrant families apart, we will refuse to do it. If the federal government tries to deport law-abiding New Yorkers who have no representation, we will step in. We will work and build on the work of the City Council to provide these New Yorkers with the lawyers they need to protect them and their families. If the Justice Department orders local police to resume stop and frisk, we will not comply. In the 1960s the racist right was defying the federal government in order to preserve segregation; in the 2010s, the multicultural left is threatening to defy the federal government in order to preserve immigrant- and minority-friendly policies. That is a pretty amazing turn of the historical wheel–even more so when you recall that the Democratic Party has been the home of both the 1960s segregationists and the contemporary integrationists. This shift also suggests that local sovereignty will be an enduring part of the American political system, even given the massive increase in the federal government’s power since the 1920s, as both left and right can find reasons to support it when they are out of power at the federal level. Actually, the segregationist governors (Ross Barnett of Mississippi, Orville Faubus of Arkansas, George Wallace of Alabama, for example) were all Democrats. Thanks for reminding me of that, I’ve updated the post to clarify.